The crowd of participants hailed from all parts of the Roaring Fork Valley to enjoy playing with magnetic fluids, experimenting with a 3-D printer, exploring the amazing properties of graphine, creating gummy capsules and getting wrist deep in oobleck. Fascination was off the charts when a chunk of ice turned into a perfect sphere via its reaction with a copper cylinder. Once again, the Aspen Science Center showed its dedication to the art of science. Kids scrambled back and forth, repeating experiences and pulling their friends and parents into the noisy and happy melee. During lunch, generously supplied by Jimmy Yeager and Grayson Stover, the owners of the venue, people refueled and conversed, making new friendships. Human chemistry is clearly a science all its own. For four hours, families came in and out, many trying, rather unsuccessfully, to convince their kids that it was time to go. “I liked the nano-sand and the gummy capsule stuff. I learned that nano-sand doesn’t fall apart like regular sand,” Adelaide Ryerson said. 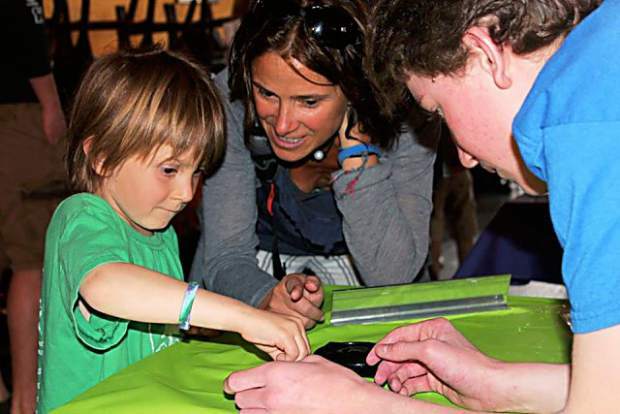 This was one of many events the Aspen Science Center hosts during the summer, fulfilling its mission of outreach into the community. Its concept, 10 years running, is to make science accessible, fun and interactive through demonstrations that are cutting-edge, entertaining, relevant, and understandable. The upcoming Science Sunday today is themed around the wonders of nano-science, but also promises the magic and mystery of bending light, invisibility and memory metals. Other upcoming events include the Master of the Edible Molecule Cocktail and Food Competition on May 17, July and August barbecues, a Stargazer and Ice Cream Social, and bringing guest scientists to town who talk with the next generation about their cool jobs. Each event is another exploration into curiosity and wonder, the most important aspects for learning through play and for understanding our world. This is the rabbit hole that kids go down when they experience quality learning experiences. As the Queen of Hearts said to Alice, “Why, sometimes I’ve believed as many as six impossible things before breakfast!” Perhaps she, too, loved science. For more information about upcoming events, visit http://www.aspensciencecenter.org.